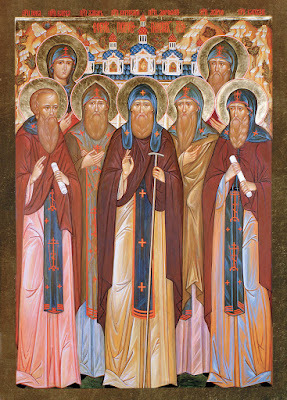 The second abbot of the Pskov Caves Monastery is identified as Elder Mark in the monastery Synodikon. 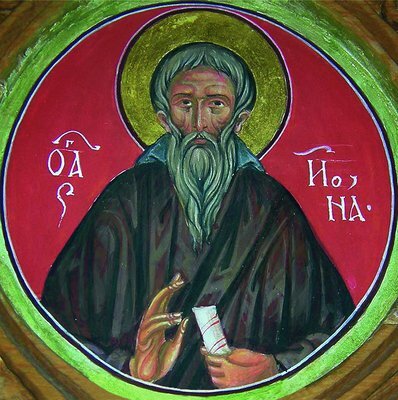 Saint Cornelius (Feb. 20) doubted the veracity of this inscription and ordered that the name be removed from the Synodikon. Suddenly he became grievously ill and it was revealed to him that this was his punishment for ordering the name of Saint Mark to be stricken from the monastery diptychs. After begging forgiveness at the grave of the Elder Mark, Saint Cornelius restored his name. 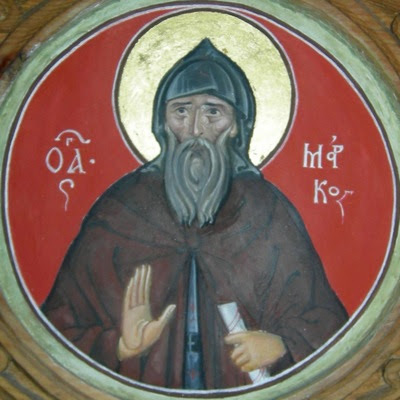 When the Cave Church of the Dormition of the Most Holy Theotokos was dug out and the burial caves expanded, the abbot Dorotheus found the grave of Saint Mark in a state of neglect, but his relics and clothing were preserved. In the year 1472, the peasant Ivan Dementiev cut down the forest on the hill. One of the felled trees rolled down the hill, uprooting another tree from the ground. The slide opened up the entrance to a cave, over which was the inscription: “The cave built by God” (There is a tradition that Saint Barlaam, a fool for Christ, frequently came to the cave and wiped out this inscription, but it miraculously reappeared every time). The priest John (nicknamed “Shestnik”, meaning "newcomer") came to this holy spot, where the first ascetics prayed. 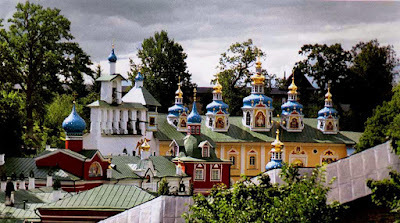 He was a native of “the Moscow lands” and served as priest at Iuriev (now Tartu) in “a right-believing church, established by people from Pskov” and dedicated to Saint Nicholas and the Great Martyr George. He and the priest Isidore spiritually nourished the Russians living there. Father John also had a wife named Maria and two sons. 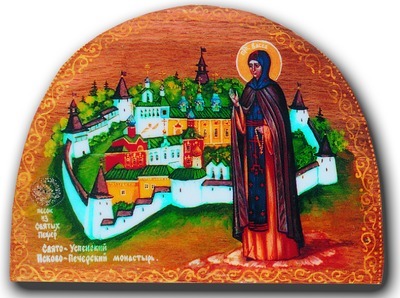 In 1470, Father John was compelled to flee to Pskov with his family because of persecution by the German Catholics, who were executing Orthodox priests. When he learned of the martyric death of Saint Isidore (Jan. 8), Father John decided to settle in the newly-appeared “cave built by God” around the year 1470, so that there, on the very boundary with the Livonians, he might found a monastery as an outpost of Orthodoxy. 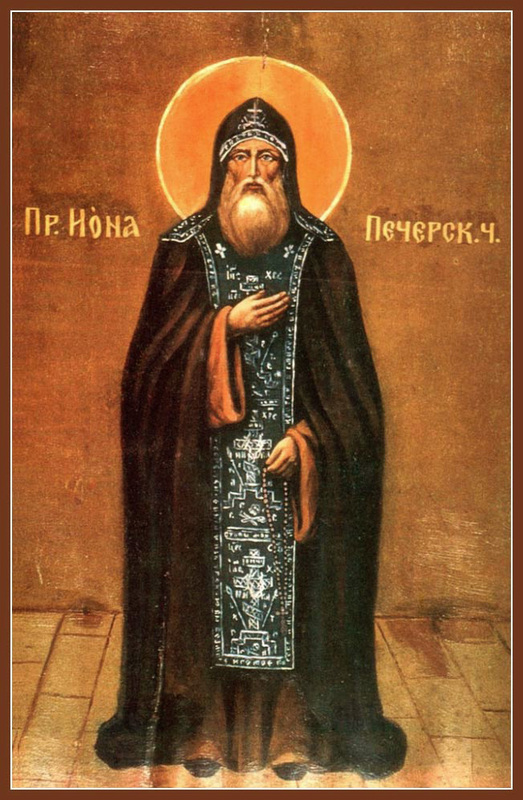 Meanwhile, he left his wife and sons in the house of Ivan Dementiev, awhile he himself began to build a church in the mountain west of the cave. 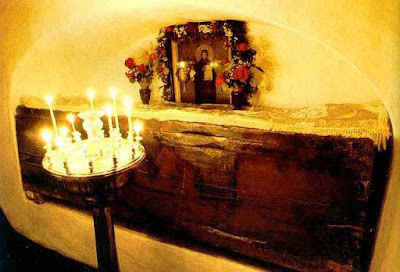 On August 15, 1473 the cave church was consecrated in honor of the Dormition of the Most Holy Theotokos. 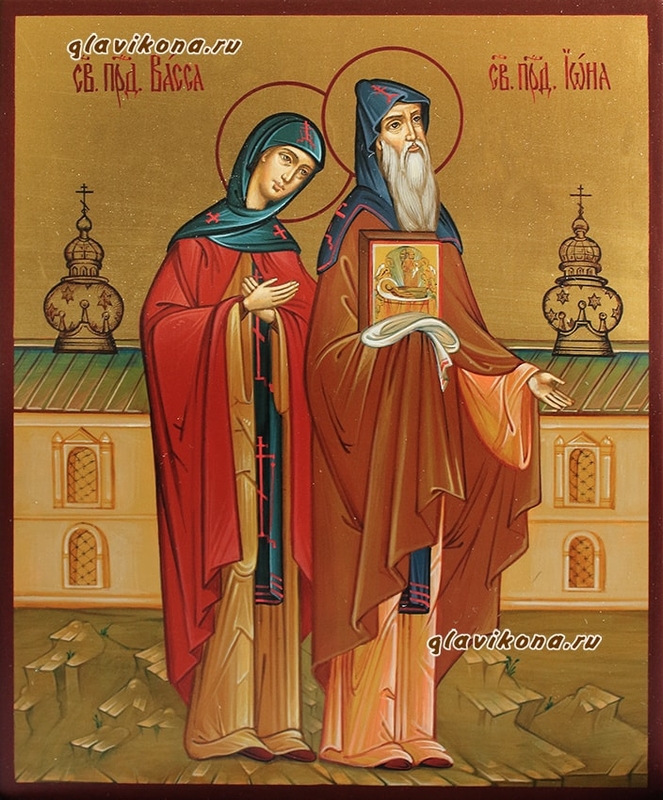 During the consecration there was a miracle from an icon of the Dormition of the Most Holy Theotokos: a blind woman “sent by the merciful God, beginning His great gifts to His All-Pure Mother” received her sight (This icon, which they call the “old” to distinguish it from another wonderworking icon of the Dormition of the Most Holy Theotokos with scenes of her life around the borders, was painted around 1421 by the Pskov iconographer Alexis Maly, and is now kept in the altar of the Dormition Church. The icon with scenes around the border is the Cave church’s patronal icon). The date of the consecration of the cave church is regarded as the official date of the founding of the Pskov Caves Monastery. 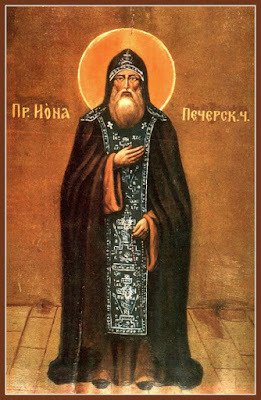 Saint Jonah labored at the Pskov Cave Monastery until 1480, then peacefully fell asleep in the Lord. Upon his death they discovered a chain mail coat on his body. This was hung over his grave as a sign of his secret asceticism, but it was stolen during a German invasion.